Need more information about booking Home 40295 ? Our villa is south west facing, so when you have had a busy day at the theme parks you can relax with a bbq around the pool, with its covered lania & ceiling fan to watch the sun go down. We have a fully fitted Games room,with pool table, foosball, dart board,Xbox, Wii and a fun exercise bike. There is also a table with 4 chairs to play,dominoes, cards, chess or one of the many board games that are stored in the unit. Cumbrian Lakes is a gated community,with stunning Lakes, walk ways, children's play area,and lots of wildlife for you to see. SunSet Villa has a coded door lock which you will need to supply us with a four digit code so our management team can program the lock for your stay with us. We are set in a gated community which gives security during you're stay, and we provide you with a gate code to gain initial access on you're arrival, you can use the gate remote when in the villa to make access that much easier to the community during you're stay, but please remember to leave this in the villa on your departure. Our management team are local and we provide contact details for them in case you need assistance when at the villa. Graham & Maureen Wooliscroft /. Fabulous locaction, 10 minutes from all the main attractions with other local amenities on the doorstep. The villa is in a gated community and all I can say is the pictures do not do it justice. The villa is fully equipped and beautifully clean on arrival. Great games room and pool area. The booking process was easy too with excellent communication with the owners . This was our second stay at the beautiful villa. Local to all the best restaurants, Wall-Mart and Target for food shops. With only a 15 minute drive we were in the theme parks, International Drive and only 45 minutes from Lego Land. The views from the pool across the lakes are so relaxing, a peaceful location and private. With plenty of room for the whole family, all the rooms are kitted out to a high standard, themed for the kids as well! We will not be looking for anywhere else when we return, only here! Easy to find. Had everything we needed and a great place to come back to after busy days at the attractions. What can I say - this Villa is an absolutely beautiful property. Perfectly maintained, very clean and with tasteful decor, also very well equipped. All the mod-cons we have come to expect (Burglar Alarm, Electronic front door lock, phone, PC, Wifi, Cable TV in all rooms with a good choice of channels, Washer, Dryer, Dishwasher etc etc) We did quite a lot of cooking in the Villa and found the kitchen had an excellent stock of utensils too! The pool & deck are a good size and get the sun pretty much all day long. The pool backs onto a lake and the views are lovely - brilliant to sit out, relax and watch the sunset (or keep an eye out for the resident Alligator!) 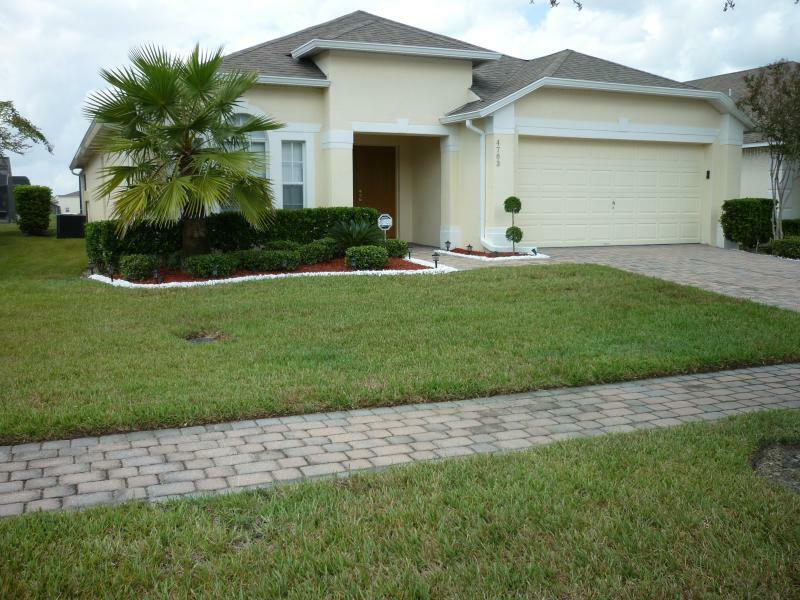 Villla is in a very quiet gated community and only a 5 min drive to the 192 in Kissimmee, plus very handy for getting to the Theme Parks. One other bonus - Liz the Manager (who is lovely) lives right next door so is easily contactable should you need her. It was also a very nice to have the little additional touches like hand soap, laundry detergent and additional toilet rolls provided - something which alot of other Villas do not provide! I wouldnt hesitate to stay here again and would certainly recommend the Villa to anyone. Thankyou to Maureen & Graham for a brilliant stay! Was great to return to Cumbrian Lakes for what was our 4th visit but our 1st to this Villa, we wasn't disappointed it was beautiful over looking the lake with the waterfall and all the birds you could watch. It was extra special to watch the Alligator and he made a daily appearance for us! Many's Chop House on the US 27 in Haines City s a definate visit, with hot rolls with cinnamon butter and enderless salad with the Entrees and Happy Hour 2 for 1 drinks 4-7pm. Thank you Maureen and family for a great place to stay, we will book again in future with you as a family or even the grand-parents. Our party consisted ot 2 seniors, 2 adults and 2 children and we all had a really wonderful time. The Villa is very well equiped and in a very good location, making shopping, restaurants and parks easy to get to. We did have a problem with the childs cot and it was replaced with a brand new one within an hour of us reporting it. The computer also played up and, unfortunately the guy contracted to fix it was in the UK at the time. Nevertheless within a few days a young lady made a 300 mile round trip to sort it out, and we were up and running again. Overall. from the time I contacted the owners to book the holiday, until the time we got back was a smooth, efficient and pleasant experience that we would like to repeat some time. The same Villa tomorrow if our Grandson had his way. Response from the owner Thank you for your review. We are pleased you had a good time & look forward to your next stay with us. You can get in touch with Graham & Maureen Wooliscroft (the owner) through the contact form on this page. Send Graham & Maureen Wooliscroft (the owner) an email through the contact form on this page. Alternatively, if there’s a phone number on this page, you can call them. How do I contact Graham & Maureen Wooliscroft (the owner)? You'll need to send Graham & Maureen Wooliscroft (the owner) an enquiry to book - the owner will let you know how to pay. If they accept online booking they'll send you a quote and info on how to pay. If you pay through our website you’ll be covered by Payment Protection. Or you can send Graham & Maureen Wooliscroft (the owner) an enquiry through the contact form to request a quote. Graham & maureen wooliscroft (the owner) will email you the total cost for your dates and how to pay. Send Graham & Maureen Wooliscroft (the owner) an enquiry through the contact form requesting a quote for your holiday dates. Graham & maureen wooliscroft (the owner) will email you the total cost for your dates and how to pay. Graham & maureen wooliscroft (the owner) of this property is responsible for taking and refunding your damage deposit. The damage deposit terms should be agreed before booking and outlined in the booking contract, if Graham & Maureen Wooliscroft (the owner) supplies one. Please refer to these details or contact Graham & Maureen Wooliscroft (the owner) directly if you have any questions. You'll need to contact Graham & Maureen Wooliscroft (the owner) to cancel. They should have provided their contact details when you made your booking - otherwise, email them through the contact form. You'll need to contact Graham & Maureen Wooliscroft (the owner) to edit your booking. They should have provided their contact details when you made your booking - otherwise, email them through the contact form.